While most of you enjoyed your Black Friday shopping, I sit here writing a new post. What's up with that? Haha! But oh well, since I am already here and I already got your attention, I'd like to share what just came off of my skillet (no kidding, we are just about to have this plate). I'm sure with the plethora of turkey left-over recipes out there, you already have an idea what to do with yours. Turkey sandwiches, casserole, soup or even paksiw na pabo (in lieu of lechon), are excellent dishes to enjoy your Thanksgiving leftovers. But wait, let me introduce you to my take on a Turkey left-over recipe: Fried rice with turkey, pineapple and bagoong (shrimp paste). It gives you a very different flavor profile from the original dish. It is a dish more similar to yang chow fried rice. And if you are an adventurous eater, you're in for a wonderful (or better yet - a sweet and salty) surprise. 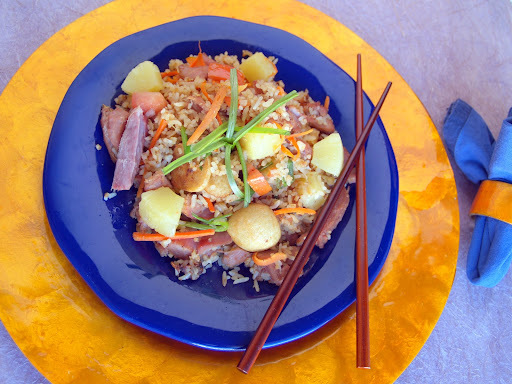 My husband has been on a pineapple rice binge lately - from Thai to Vietnamese style fried rice, he has savored and obsessed with lately. He challenged me to make a plate that should be as good as the one that he orders from his favorite restaurant. Well, he said my version was way better... LOL. The secret really is to use day-old rice. Day old rice is dry and that's what you need to avoid soggy fried rice. Another secret that I used here is bagoong (shrimp paste). Well, if you cringe at the idea of using shrimp paste, you can substitute it with fish sauce or salted fish or just plain salt, but no soy sauce please. Keep an open mind and you are in for a wild adventure! Saute garlic and onions until wilted. Add tomatoes, stir and mush the tomatoes. Add bagoong,stir for a minute. Add rice and cook for about two minutes. Or until the steam from cooking begins to sweat the rice Dig a hole in the middle and pour the slightly beaten egg. Stir altogether. Add veggies and pineapple. Enjoy! Better late than never. Greeting you Happy Gobble Gobble. Hi Malou, ...looks like you had a wonderful Thanksgiving! As for us, we did not have any leftovers, which were given away with a portion of the entire dinner! Love your creativity, of this fabulous dish, and so delicious:) Have a wonderful Sunday...mi amiga! My husbands hates bagoong and can't understand why my family and I LOVE it :) I'm bookmarking this recipe lol I just won't tell him there's bagoong in it!